Can’t resist the temptation of wearing those stylish flip flops? Are your cracked heels becoming an unwanted hurdle? It’s the time to take care of your heel fissures which is very common problem experienced by millions throughout the world. In most cases, it may just seem unattractive however, deep cracks may be painful when you stand or walk. It may sometimes bleed too. 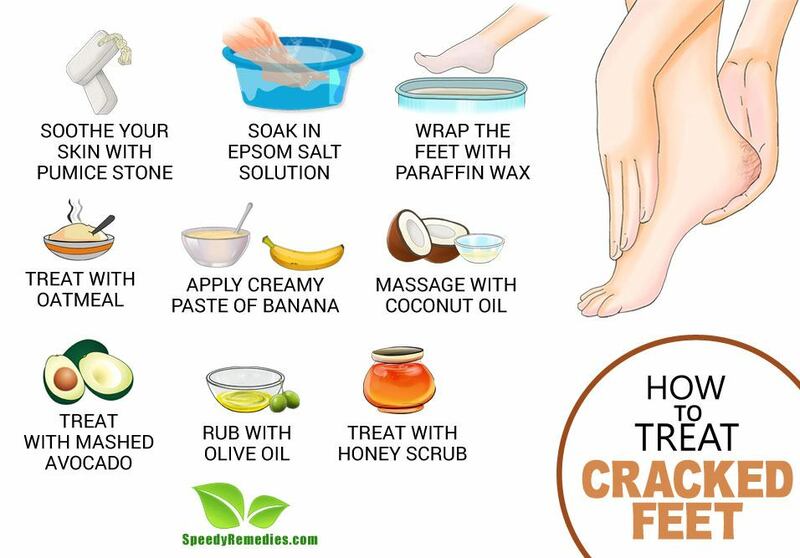 So, here are some home remedies to help heal your dry, cracked heels quickly with simple ingredients that you probably have in your kitchen and bathroom. Standing for a long time, especially on hard floors. Increased weight or obesity, which puts an extra pressure on normal fat pad under the heel, causing it to expand sideways. If your skin is not flexible enough, the pressure can crack your heels. Neuropathy in diabetic patients can cause a loss in ability to perspire leading to skin dryness. Increased pressures in the heel area. Though rare, but women with Sjogren ’s syndrome may create dry skin as their body’s autoimmune system attacks moisture-producing glands and thus perspiration. Psoriasis, eczema and fungal infections in skin may also be behind drying and cracking of feet skin. Wearing open-back shoes and sandals as they don’t provide support to hold fat pad. The problem of cracked heels can be avoided by taking its proper care. However, in extreme cases you can ease pain by medical attention. And, in case you are interested in treating your feet naturally by some effective home remedies you can get a clue from here. Soften your cracked skin by plenty of soapy water. Wet the pumice stone with water and rub it on dry and cracked areas of your skin. You’ll be able to soothe your skin this way. Alternatively, make a foot soak by mixing petroleum jelly, moisturizing shampoo and warm water. Rub this mixture on your skin followed by use of pumice stone. Petroleum jelly helps moisturize your skin and seals the moisture present inside your feet’s skin to support healing. You can do this treatment two times in a day. Don’t forget to apply moisturizing lotion. Make a solution by mixing a bucket of water with 1/3 cup of epsom salt. Soak your feet in this solution for ten minutes to exfoliate your feet. Use the pumice stone to soften the rough areas. After this, apply moisturizing lotion on your feet to avoid further dryness. Sesame oil or jojoba oil may also be used to keep your feet moisturized. Repeat this process two or three times in a week. Since poor circulation may be one cause behind your dry skin, regular foot soaks can help prevent dry skin by improving circulation. Oatmeal can also be used to soften your cracked feet. Soak your feet for 30 minutes in the foot basin containing a cup of oatmeal. For better results, you may add honey or olive oil to it. Form a paste by adding one tablespoon oatmeal to one tablespoon of olive oil. Apply this paste to the affected areas of the foot and then rinse after half an hour. Repeat this process for few times in a week to help heal your dry and cracked feet quickly. Melt paraffin wax in a microwave until it seems warm on touching. Add mustard oil as much as you have taken the wax. Dip your feet in this wax. Take it out and allow the wax to harden on your feet, dip your feet again. Finally, after two or three times dipping and pulling wrap your feet in plastic. After fifteen minutes, remove the wax and plastic to find your feet soft, smooth and flexible. Mix a quarter cup of white vinegar in a mildly warm water foot bath. Soak your feet in this mixture for 10 to 15 minutes. After soaking, use pumice stone to exfoliate, let it dry completely. Afterwards apply moisturizing lotion for further smoothening. Pour two tablespoons of fresh lemon juice in mildly warm water. Soak your feet in this solution for 15 minutes. Use a stiff brush to remove dead skin from your heels. You may also mash papaya with lemon juice to make a paste. This paste can be pressed on the cracked feet. After rinsing, moisturise your feet. Make a creamy paste by blending few bananas in a blender. Wash your feet and apply this paste for 15 minutes. Rinse and once again wash your feet, first with warm water followed by cold water. Repeat this process everyday for few months. Natural enzymes found in banana help encourage cell turnover and moisturize skin as well. Mix glycerin, salt, lemon juice, and rose water in a vessel. Soak your feet in this mixture for ten minutes, and then scrub with a pumice stone to smooth your skin. You can also apply a mixture of glycerin and rose water to your cracked skin daily for a couple of weeks, in order to make it supple once again. Make a scrub by mixing honey, rice flour and apple cider vinegar. Leave the scrub on your cracked heels undisturbed for ten minutes and then wash your feet. Your cracks may start looking better after few months as natural enzymes of honey may help speed up healing of your skin and bind moisture as well. Heat some olive oil mildly. Rub this oil on the cracked areas of your feet by using a cotton ball dabbed in oil. Wear cotton socks later and wait for an hour, then wash your feet properly. Make sure to moisturize your feet after this application. Your heels should feel smoother by massaging it with a spoonful of coconut oil in the night. Make sure you cover cracked heel with heel socks. Coconut oil is supposed to be a natural sanitizer that could help kill germs leading to infection. You can also treat your cracked feet by rubbing pure mashed avocado on the affected heels and rough patches of your skin. Let it soak at least for an hour. Rinse it off then. Strapping that could reduce skin movement by bandaging around your heel. Insoles, heel pad or heel cups may be prescribed to redistribute the weight of your heel and provide better support. It could also prevent the fat pad from expanding sideways. Special tissue glue may be advised that will hold the edges of the cracked skin together so it can heal fast. Debridement in which your hard skin would be cut away by a health specialist.